Based on the message that came with this award, the PROXIMIDADE AWARD are given to charming blogs whose aim is to show the marvels of friendship. 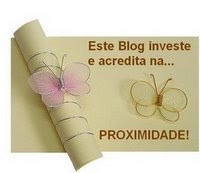 The bloggers are persons who interest to find and be friends, they do not interest in prizes. Wow, what an honourable award!! Congrats for this special Portuguese award! I´m Portuguese and your translation is correct. I don´t think it´s confusing. Proximity here means "close to" and you got it all right. This award is a friendship award that we give to those bloggers we consider friends to cherish their friendship. Thanks so much for sharing it..
Oprah is really an ispiration to all women to dream and to overcome all obstacles in life. May you be prettier, richer, healthier and happiest this coming new year!! Happy year 2009! Congratulations for the awards. Nice blog you have here. Nice blog you got here! Cute template.. Anyway, congrats for the award that you received..
Wow, what a great wisdom! Thank you for the reminder of the timeless values. "Be thankful for what you have; you'll end up having more..." Yes, yes and yes! "Having more" is being grateful for what we have at a moment we raise up our eyes and open the hearts for to smell the wild flowers. Congratulations, I guess for the achievement of maintaning your alexa and google rank.